The iConverter T1/E1 media converter provides standard T1 (1.544Mbps) or E1 (2.048Mbps) copper-to-fiber conversion and can be used to extend the demarcation point between service provider and networking equipment. T1/E1 media converters operate in pairs, extending distances over fiber, which improves noise immunity, quality of service, intrusion protection and network security. The iConverter T1/E1 is a T1 (1.544Mbps) or E1 (2.048Mbps) copper to fiber media converter, and is available as a compact unmanaged standalone unit or a managed chassis plug-in module. The iConverter T1/E1 can be used to extend the demarcation point between service provider and networking equipment. The iConverter T1/E1 media converters operate in pairs, extending distances over fiber, which improves noise immunity, quality of service, intrusion protection and network security. The T1/E1 supports both standard and CWDM Small Form Pluggable (SFP) transceivers, enabling adaptability to different fiber types, distances and wavelengths, providing maximum flexibility across a variety of network architectures and topologies. The T1/E1 also supports multimode and single-mode dual fiber with ST, SC and LC connectors; and single-mode single-fiber with SC connectors. Designed as a transparent repeater, the iConverter T1/E1 supports standard T1, E1 and Primary Rate Interface (PRI), voice or data. The converter also supports AMI, B8ZS and HDB3 line codes. DIP-switches provide easy configuration of T1/E1 line codes and line build-out. The iConverter T1/E1 features user-selectable Local Loopback, Force 1s to Copper, Force 1s to Fiber, and Fiber Optic Test modes to facilitate diagnosis of the remote unit, eliminating the cost of external hardware or support personnel at each end of a link. The copper interface features an RJ-48 connector for balanced T1/E1 applications, and models featuring coaxial BNC connectors are available for unbalanced E1 applications. The hot-swappable plug-in module can be mounted in a 19-Module (2U high) or 5-Module (1U high) rack-mountable chassis (19-inch or 23-inch) with redundant AC, 24VDC or 48VDC power supplies. It can also be mounted in a 2-Module AC or 18 to 60VDC powered chassis, or in a 1-Module AC or DC powered chassis. The T1/E1 standalone unit is available as a wall-mount unit. The wall-mount models are DC powered and are available with an external AC to DC power adapter or a terminal connector for DC power. The iConverter T1/E1 media converter provides a cost-effective solution for extending telecom demarcation points. A pair of T1/E1 converters is used to extend the demarcation between buildings via fiber. Multimode or single-mode fiber can be used, and fiber links can be extended up to 60km using single-mode fiber. The iConverter T1/E1 plug-in module can be used in managed or unmanaged applications. Management provides remote configuration, monitoring and trap notification. Management of the T1/E1 plug-in module is accomplished by installing an iConverter Management Module (NMM2) or Network Interface Device (NID) in the same chassis. The Management Module can be accessed via SNMP, Telnet, and serial port. The T1/E1 can be managed with Omnitron’s intuitive, graphic-oriented NetOutlook SNMP Management Software or third party SNMP management software. Management via the Telnet and the serial interfaces have an easy-to-use, menu-driven interface. The management software can override the physical DIPswitch settings such as line settings and loopback control. Some of the real-time T1/E1 parameters that can be monitored include power, link, data status, module type and model, hardware and software revisions, serial numbers and a user-defined identifier. 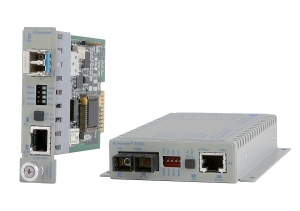 The iConverter T1/E1 supports SNMP trap notification for the monitoring and notification of different network events. Specific events that generate traps include module insertion and removal, and port link-up and link-down. Trap monitoring of specific events can be selectively enabled or disabled by the network management software. 2Plug-in module occupies 2 chassis slots, and is not compatible with 5-Module or 1-Module chassis. 3When using single-fiber (SF) media converter models, the Tx wavelength on one end has to match the Rx wavelength on the other.